Spring Loaded builds unique knee brace technologies. Their flagship product is the world’s first bionic knee brace. After 18 months of intense research and development, Spring Loaded had a viable product and were ready to sell. Spring Loaded engaged CloudKettle to help develop a digital marketing and sales strategy that would run in the months leading up to a pre-sales campaign. The goal was to raise $75,000 USD over the course of the 30 day pre-sales event. “Marketing, for us, is a way of gathering very specific intelligence to make us better at what we do. Knowing who your customers are is where it all starts. Investing in marketing in our early stages helped us shape important decisions about our entire business. Ranging from who the customer was, to what the product looked like, to what our go to market strategy was and beyond,” says, Chris Cowper-Smith, CEO of Spring Loaded. Spring Loaded sells a high-end knee brace that retails for $2,380 CAD. For most consumers, spending that amount of money comes with research and consideration. 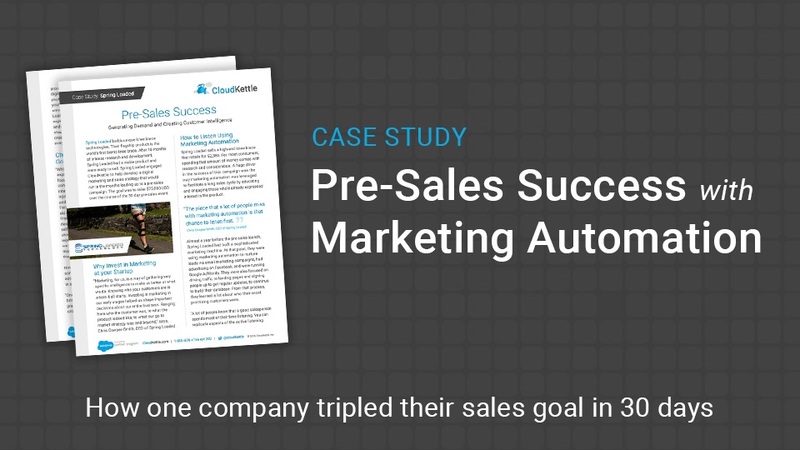 A huge driver in the success of this campaign was the way marketing automation was leveraged to facilitate a long sales cycle by educating and engaging those who’d already expressed interest in the product. “The piece that a lot of people miss with marketing automation is that chance to listen first,” says, Chris. Almost a year before the pre-sales launch, Spring Loaded had built a sophisticated marketing machine. At that point, they were using marketing automation to nurture leads via email marketing campaigns, had advertising on Facebook, and were running Google AdWords. They were also focused on driving traffic to landing pages and signing people up to get regular updates, to continue to build their database. From that process, they learned a lot about who their most promising customers were. “A lot of people know that a good salesperson spends most of their time listening. You can replicate aspects of the active listening process using marketing automation and digital advertising. Done properly, this allows you to collect insights on mass about who your customers are and then get really smart about how you target them. At Spring Loaded, we spent a lot of time listening and experimenting using marketing automation and digital ad targeting.What we learned shaped everything from our ad copy and creative, to how we targeted people and everything in between,” says, Chris. “While continually learning from our marketing experiments, our targeting became more focused on people with very specific conditions, like knee osteoarthritis, or specific interests that left them vulnerable to knee injuries, like skiing. We then got really specific and as an example, ran campaigns on Facebook that targeted a number of small ski destinations throughout North America. From that process, we learned which ski destinations showed the most promise to sell our knee braces when we launch. In short, when considering which segments would be the most promising to target, we focused on both who would benefit the most from our product, and who showed the most tangible interest,” says, Chris. Not surprisingly, Spring Loaded discovered some of the injuries their products helped address were most common among people in an older demographic. “One of the big challenges we faced was bringing a mature demographic into a pre-sales space and specifically onto a crowdfunding platform, which they were very unfamiliar with. The use of video was integral to our success because it was our opportunity to connect and engage meaningfully with that audience. Our videos showed the character behind our company and positioned the product as something that could work for the specific demographics we were focused on,” says, Chris. As the pre-sales event drew closer, Spring Loaded invited the most engaged members of their following to an exclusive product launch event. Using marketing automation to track engagement, Spring Loaded selected 1,500 people out of a database of 10,000 and gave them exclusive access the day before the full launch to buy products. “The combination of working on the principle of exclusivity and having nurtured those 1,500 people for a long time, helped us hit a homerun on the first day of sales. We achieved our original campaign goal in just 24 hours and went on to far surpass $75,000 – raising a total of $208,000 USD in 30 days,” says Chris. Download a pdf version of our Case Study: “Pre-Sales Success: Generating Demand and Creating Customer Intelligence” below. If you have any questions about the case study or Marketing Automation don’t hesitate to contact us.